For students in grades K-8, HOBBES' Coastal Expeditions programs help connect learning to the local marine environment with in-class and boat-based investigations of the marine world. Designed to reinforce Massachusetts curriculum frameworks, these standards-based programs provide an excellent opportunity to link math and science curricula to marine conservation issues of local relevance. Teacher Resource Guides accompany each program, which provide an overview and background information about the topic, and include pre- and post-program activity suggestions for teachers, including extensions to art, literature, social studies and history, to help integrate Coastal Expeditions learning with other disciplines. 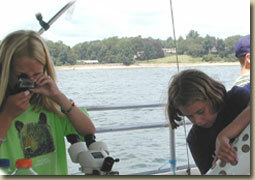 Choose from our menu of programs - choose in-class or boat-based programs or both. In-class programs (at your school) are available for groups up to 25 students (duration - 60 min). Boat-based programs are available only during May-October, for groups up to 50 students (duration - 4 hrs.) departing from Salem Willows Park, in Salem, Massachusetts.